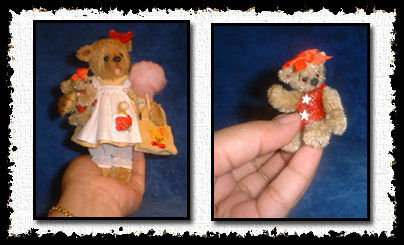 "Salma" is a lovely little girl, (she's totally designed and sewn by hand (including her outfit) , she's 6" tall , made of a lovely golden with darker backing of mohair fabric and matching ultraseude, she has glass eyes , black & waxed embroidered nose, she's 5 way jointed with cotter pin/disc ,armatures (in her arm) , and stuffed with fiber fill and tiny steal shots . She comes wearinga a lovely dress, made of orange floral cotton & white cotton fabric .. her dress has little details and accessorized with buttons .. also she's wearing white cotton bloomers. 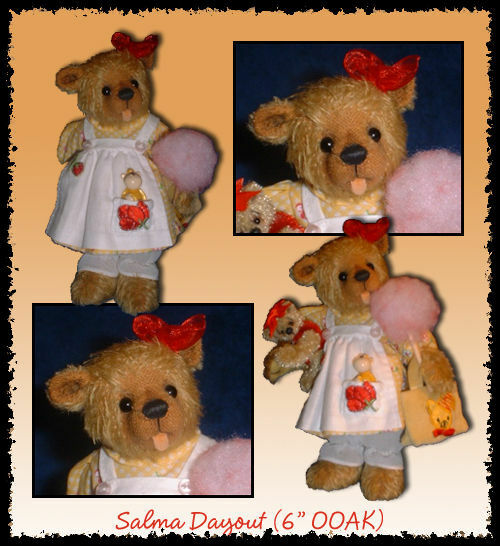 "Salma" loves to go out , and she just had her lovely day out , taking her favorite teddy and her tiny monkey ( in her pocket) to the fun fair , she also loves candy floss... Her teddy is made of vintage long pile (olive green - red) , he's about 2 1/4" and fully jointed , has onyx eyes and black embroidered nose..
Salma is a real good piece , her clothing was made , by hand , stitched carefully to give a real great details , taking me longer time to complete , she's a wonderful piece to add to your collection , I guarantee that ..